I am reviewing the HP Envy 100 ePrint-enabled all-ine-one printer which is another member of the HP “Envy” high-end stylishly-designed equipment range. This printer is styled not like an ordinary all-in-one printer but something that wouldn’t look out of place alongside domestic hi-fi or home-cinema equipment. There is a lot about this printer’s styling that makes it not like the typical all-in-one printer that I have used or reviewed. This printer has a design that wouldn’t look out of place in a hi-fi or home-theatre equipment rack with its slimline and neat styling. Here, it would be as slim as the typical VHS video recorder or “personal-TV service” unit. Even the scanner lid reminds me of that flat-glass lid used to cover the turntable on a mid-1980s “music-centre” stereo system because of the way it lies flush with the top of the printer and is made of that similar glass. Where do the documents come out of? The way the printer is styled may confuse some people because there isn’t an obvious paper tray or output tray. When you want to use the printer from the control panel, you work it using a large touchscreen on the front of the unit. This touchscreen can be positioned at an angle for easier operation but will swing up when the printer is printing out anything. The paper is loaded in to a shallow removeable tray which you pull out from the front of the printer. Even the SD slot for your camera card may be hard to find but it is located on the top right edge of the printer, under a small flap. The printer can work with 802.11g/n WiFi networks that are secured using WPA2-PSK technology. You enter the passphrase for these networks using a virtual keyboard on the unit’s touchscreen; but it also works properly with WPS “simplified-setup” routines that most recent-issue home and small-business routers support. On the other hand, the software that is supplied on the CD-ROM leave a lot to be desired. It doesn’t operate properly with network setups and you may have to try many attempts at setting this software up on your computer. This is more so with firewall software that may be slow to respond. The printer works as expected for a colour copier. As well, it can print from or scan to SD cards or USB memory keys. Like with all printers, these functions could be improved through increased memory in the unit. Here, images obtained from the scanner or removable media could be copied to the memory before being printed so as to allow quicker and more productive operation; such as being able to quickly copy many pages or print pictures from your camera then continue snapping more pictures. 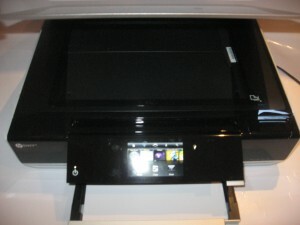 Through the use of the ePrint Web apps, this printer can print documents on demand. As well, some of these ePrint apps work as client programs for various photo-sharing or social networking sites, so you can print pictures from your albums that exist on these sites. It also supports the HP ePrint “email-to-print” system which allocates the printer an email address so you can send documents or photos to that address for printing. This also allows for Apple iOS devices to print documents and images directly to this printer using AirPrint. It is also worth knowing that Android users can download the “HP iPrint Photos” app from the Android Market to their device so they can print photos through this printer. At the moment, there isn’t a full document-print solution available for this platform yet. When used with a Windows 7 machine, this printer works tightly with the operating system, thus using functions like the Device Stage. Even the ability to set up device-initiated scanning for a network-connected printer requires you to visit the Device Stage which comes up when you click on the printer in “Devices and Printers”. This feature has still got some problems with reliability in that it won’t start properly or expose the options to the printer’s control panel. This function is still something that has to be worked out and should be part of the operating system as I have touched on previously. Other than that, it does work properly as far as computer-initiated printing goes. It also does offer proper support for basic and advanced UPnP printing functionality; something I find that is not implemented in many client devices like set-top boxes. This is not enabled by default and you would have to go to the printer’s Web page which is at its URL, then go to “Networking” to select and enable this function. 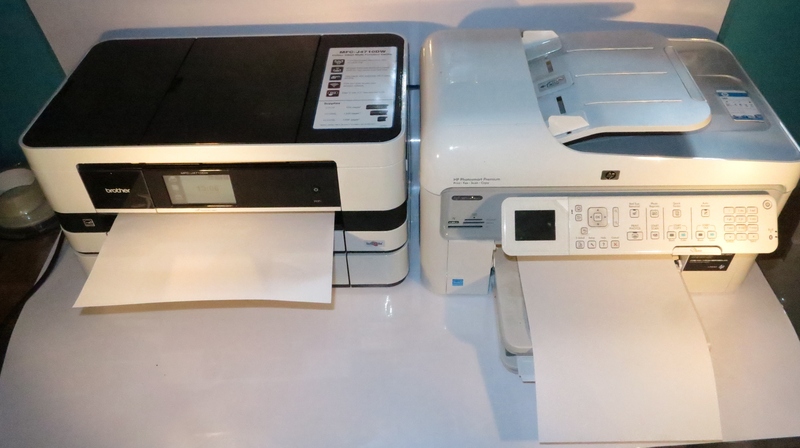 This printer works as expected for an inkjet printer when it comes to printing documents. But the real test I notice with these inkjet printers is how they handle photographic images. The pictures don’t come out as saturated as most of the other inkjets that I have tested. As well, they are not as dark as those printed on most of the other inkjet printers that I have tested. As with all HP inkjet printers that have auto-duplex printing, this function still requires a significant top and bottom margin, which can be very limiting for desktop publishing applications. I have raised this issue on forums operated by HP, but they say that this is a designed-in limitation to assure proper auto-duplex operation but I have seen auto-duplex-equipped inkjets available from other manufacturers, namely Canon, which can print this way without requiring the top and bottom margin. As well, the use of a tri-colour ink cartridge makes the printer more costly to run because you can’t replace individual colours as needed. This could be improved upon by HP when they refine their low-profile print mechanism that is used in this printer. The slimline design also has a limitation with the paper tray not being able to hold much paper. The manufacturer-supplied software could benefit from a lot of work on it, especially with the way it operates with network printers. This includes making it work tightly with the operating system’s services and properly discovering the printer and announcing the computer’s network location. This is always something that manufacturers tend to forget about when designing their printers. The way HP have integrated a duplex-capable inkjet print mechanism with “front paper feed” as well as an LED-based scanner mechanism into a chassis the size of a typical VHS video recorder has amazed me with this unit. Here, they could take the concept further with various product ideas for inkjet printers and similar devices. 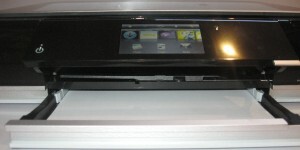 One could be a rack-mount printer for “built-in” applications, where the printer is pulled out like a drawer when it needs to have new ink added or be serviced. Similarly, there could be the ability for HP to design a transportable “all-in-one” printer modelled on the Envy 100 that is designed for “on-location” workforces. This would have a handle of a style not dissimilar to that found on a boombox and having the scanner lid kept closed by a latching mechanism. Electronically, it would have full WiFi and Bluetooth connectivity and work on 12 volts DC, thus being able to work from a car’s cigar-lighter socket or a 12-volt rechargeable battery pack. This printer is targeted to those who place a lot of emphasis on style and may suit those of us who are particular about what can be placed in the common living areas of the house. But it wouldn’t be worth using as a main printer for a home or small business because of the two-cartridge system or the reduced paper capacity. Here, I would recommend it for use as a secondary printer intended for use in the family room if you can accept the price for this application. Spot on review – I just picked up the Envy100 printer from the apple store, two main impressions, first ridiculously easy setup, turn on and start printing.. wow… second.. slow as molasses in January, this ain’t going nowhere in a hurry. Totally agree, this form-factor have something going for it, and could be placed under other stuff. My personal use is because I own a hostel and am sick and tired of solving driver problems when guests need to print boarding passes etc. 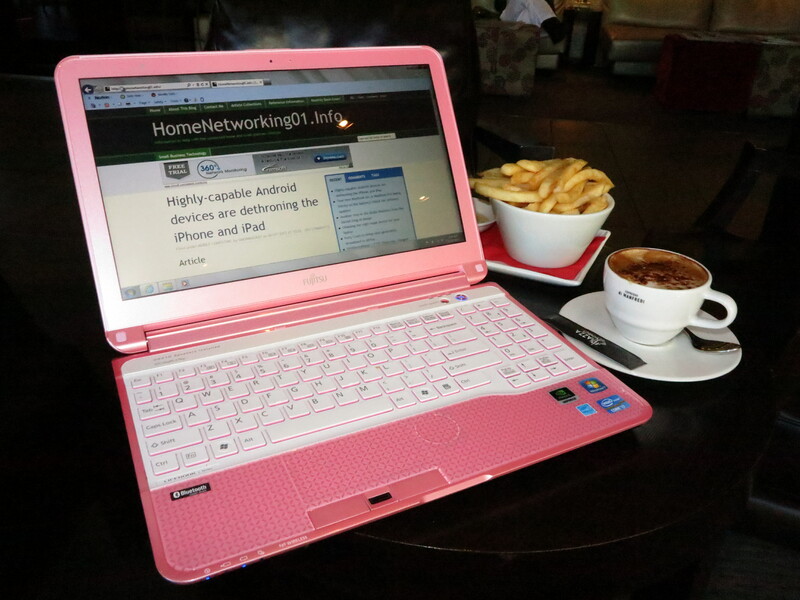 the ENVY100 is the new printer in our print cafe, except now there is no cables, email and print baby, for my use the only feature of interest is the ePrint, and so far it works fantastic.! If you are a iPad user, this is the liberator, using the HP ipad app, it is possible to scan and print with this unit, both is breathtakingly easy, open the app, click on preview and the unit starts scanning just like that… this is the printer/scanner which make life with only a ipad totally possible. I picked up an Envy 100 at the Apple Store this afternoon and have spent 4 hours trying to get it to work, including more than an hour on the phone with HP tech support. Installation and setup went fine, both my MacBook Pro and my G4 found the printer with no problems. But neither can print – I always get an error message telling me the color cartridge is in the wrong slot. It’s not. I *can* print from my 3GS phone. It had no HP software installed. HP has decided to send me a replacement. That’s nice of them, but I’m doubtful. It’s been a completely miserable experience so far. Infact I prefer that people download the latest software from the manufacturer’s Website rather than running the software supplied on the CD. This may be an older version that may have some bugs in it.